The root of the perennial herbaceous plants Paeonia lactiflora Pall. of family Buttercup. Zhejiang, Anhui and Sichuan provinces in China. Plucked in summer and autumn, peeled, boiled, dried in the sun. Slight smell, slighdy bitter and sour taste. 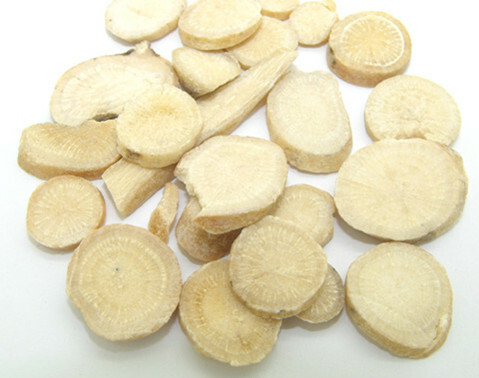 Coarse and straight long root, bright and clean cover, firm and rich in powder. Bitter, sour, sweet, slightly cold; spleen and liver meridians entered. Tonify blood, astringe yin to check sweating, emolliate liver to alleviate pain, calm and suppress liver yang. 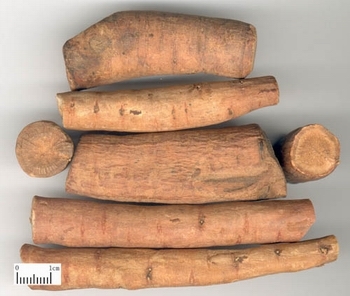 It is a common herb applied for regulating menstruation, and it is very indicated for irregular menstruation of blood deficiency with heat type because it is cool in property and skilled in clearing deficiency heat in blood system. For irregular menstruation of blood deficiency with heat type, it is combined with blood-nourishing and heat-clearing herbs, for instance, Si Wu Tang add Huang Lian, Huang Qin is Qin Lian Si Wu Tang from Yi Zong Jin Jian. For irregular menstruation of blood deficiency with liver depression type, it is combined with liver-soothing and blood-nourishing herbs, for instance, it is used with Chai Hu and Dang Gui in Xiao Yao San from Tai Ping Hui Min He Ji Ju Fang. For metrorrhagia and metrostaxis in dark-red color, annoyed heat in chest due to yin deficiency with effulgent heat, it is combined with yin-nourishing and heat-clearing herbs, for instance, it is used with Gui Jia, Huang Qin, Huang Bo in Gu Jing Wan from Yi Xue Ru Men. It can astringe yin to check sweating. For night sweat due to yin deficiency, it is combined with yin-nourishing and sweating-checking herbs, such as Sheng Di Huang, Mu Li. For spontaneous sweating due to superficial deficiency caused by disharmony of Yin and defensive system, for instance, it is used with Gui Zhi in Gui Zhi Tang from Shang Han Lun. This herb is expert to alleviate pain by emolliating liver and it's a commonly used herb for those above-mentioned pains due to liver-blood deficiency and tendon dystrophy. It's often applied with Gan Cao as mutual reinforcement, such as in Shao Yao Gan Cao Tang from Shang Han Lun. The modification of this formula is often used to treat contracture occurring during the process of many diseases. 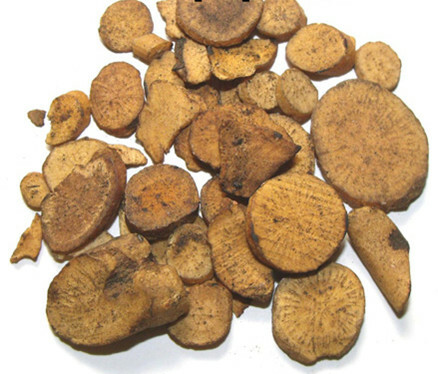 This herb can subdue liver yang and clear liver heat. It's applied to treat dizziness and vertigo, flushed face and conjunctive congestion, irritability, the problems caused by hyperactivity. It is often combined with herbs which can subdue hyperactive liver yang and clear heat and replenish yin. For example, as Jian Ling Tang recorded in Yi Xue Zhong Zhong Can Xi Lu, it is used together with Dai Zhe Shi, Sheng Di Huang, etc. Decoct 10~30 g. 15~30 g for large dosage. Raw material for pacifying liver and astringing yin; stir-baked or stir-baked with alcohol for nourishing blood and regulating menstruation.